When you reach your lines via the Aiguille du Midi lift, you need focus, not doubt. 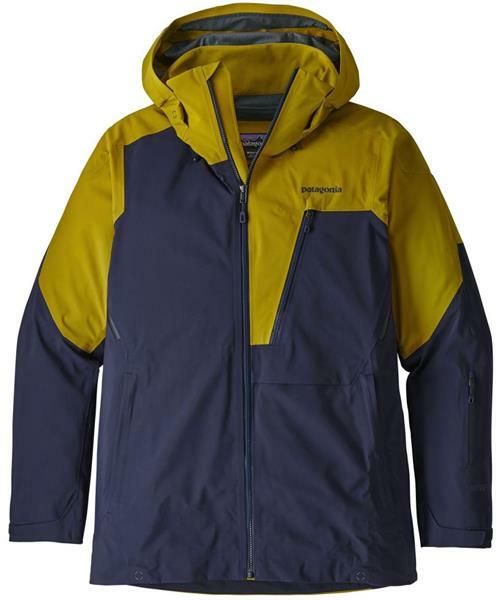 Patagonia's Untracked Jacket, built with unwavering attention to descent-oriented details, features a versatile, 3-layer 100% nylon Gore-Tex® fabric for unsurpassed windproof and waterproof/breathable performance. The fabric package includes a DWR (durable water repellent) finish to prevent saturation; a moisture-managing brushed interior lining in the upper body that increases warmth and comfort without extra bulk; and a slick, snow-shedding nylon lining in the lower body to provide a smooth glide when layering. Pit zips allow a cooling airflow for steamy days, but when it blows, a fully adjustable, low-profile powder skirt with a single snap seals out spindrift and flyaway (includes a webbing loop that attaches to any Patagonia® Snow pants). The helmet-compatible, 2-way-adjustable hood has a soft, laminated visor to preserve visibility in wind-pushed snow along with the Cohaesive® cord-lock system that embeds cord locks in the hood and hem to eliminate loose ends and provide easy adjustability. Coated, watertight Slim Zips throughout reduce bulk and weight, and a tweaked fit this season gives the Untracked a more tailored silhouette. Pockets: two handwarmers; one chest with a secure media pocket and cable routing; one pass pocket on the left forearm; one internal drop-in for goggles and gloves; and one internal stash (for your après-ski brew). Includes an embedded Recco® avalanche rescue reflector.